The Satori Movement started as a skateboard wheel company in 1998 and has expanded to become the premier supplier of organic, hemp, bamboo and organic cotton clothing. 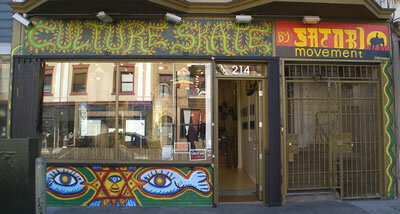 In August 2007 Satori opened their first retail location: Culture Skate at 214 Valencia Street @ Duboce Street in San Francisco, CA. This store carries sustainable men’s and women’s garments, Satori, Creation and Yellow Brand skateboard goods and elegant handmade jewelry by Jewel of the I from Oregon. Satori recently acquired Wisdom Records’ entire collection of records, 45’s, EP’s and LP’s which are also available at the store. The store has a naturalistic feel with bamboo fixtures and natural tones in a beautiful open space. Shopping at Culture Skate gives the customer a simple, yet organic shopping environment. With an eco friendly mindset Satori Movement presents Culture Skate.